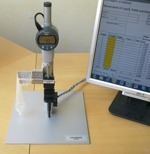 For measuring the condom width, scale resolution 1 mm length 300 mm with calibration certificate. 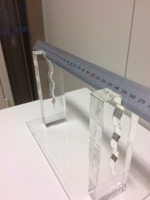 The ruler is delivered with an acrylic table stand to hold the ruler horizontal in a 30-degree angle to give better ergonomics and facilitates a quick and accurate reading. VALENDOR’S AWT is accurate, fast and easy to use. There is no need to remove lubricant before testing. The test item is placed on the on the two wings. Press the lever down until stop and the measurement is entered in the template for reporting dimensions on the computer.